Although multiple New Jersey and New York-based grocery chains opened or considered opening outposts in Florida (including ShopRite! ), the only one that maintains a significant presence is Bravo. Bravo is run by White Plains, NY-based Krasdale Foods and was created in 1999 to target Hispanic populations of New York City. The Bravo we're looking at today is the farther-west one. In my experience, Bravo stores (and its sister chain C-Town) have always been reliably good -- usually clean, well-stocked, and reasonably-priced. I was, therefore, quite disappointed in this Bravo, which was overall rather depressing. This beautiful monument sign sets the tone very well for the rest of the store. Seriously, though, I visited Florida at Christmas of 2017, just a few months after the devastating 2017 hurricane season. Although Tampa did not see particularly extensive damage, it's possible damages like this sign were caused by the high winds. Let's start on the outside. This Bravo was previously a U-Save supermarket and switched sometime between 2011 and 2015. Hard to tell exactly why, but it could be because of U-Save's investigation by the labor department in fall 2011. The owners of this Bravo appear to be the same as U-Save, run by Oqab Abuoqab (now that's quite a name) under the company Mi Supermercado 3 LLC. The carts have been kind of switched for Bravo. They're former Winn-Dixie carts whose Winn-Dixie logos have been scratched out and replaced with Bravo lettering. As a result, the aisle directory is completely wrong. Is it the dark rainclouds in Bravo's sunrise or the Super Markets lettering that looks like it's about to fall down that bothers me more? Hard to tell. There used to be an entrance on the right side of this facade section, but it is now closed in favor of one right in the center which doubles as an exit. Uh, someone could spell "inconvenience" but not "the"? And "de" isn't like "teh", your fingers don't accidentally slip and type "d" instead of "th". OK, first impression - not bad. Produce runs along the first aisle, with deli/bakery in the back corner, meat/seafood along the back wall, and dairy in the last aisle. However, upon closer inspection, it's clear that the sales floor has been cut back (hence the door change). Notice the fact that the light fixtures go past the produce cases. Sales floor reduction notwithstanding, the first aisle looks pretty good. The produce was fresh and well-priced, and the grocery shelves facing are very nice. The selection was much more specialized than Bravos in the NYC area. You'd have a much harder time finding mainstream vegetables and fruits here than at a New Jersey Bravo. This likely comes from the fact that the mainstream grocery stores in the Tampa area make much less of an effort at ethnic merchandising. Looking back up towards the front. Notice the stacks of rice on the left which cover the entrance to the closed-off area. Meat & Seafood is actually one of the better-looking departments. You can tell that the store used to be larger than it is now when you make a right behind the closed-off area and go towards the deli-bakery area. Now here's the problem. First off, I doubt Irma actually dropped by to do some food shopping and blew the letters off the wall in the hurricane season. Second, this decor is not that old. In fact, the style and design look pretty new. So it must just be cheaply made. I'd hate to be an employee in Del & Bke, since you never know when the next letter might fall down! There is a seating area across from this counter, against the area that's closed off. Looks like there's not too much fresh bread or rotisserie chicken selling anymore, given the displays next to the seating area (which looks straight out of a 1980s fast food restaurant). Here's a look inside the closed section, now used for storage, I guess. If you zoom in, it appears the produce department used to be much larger -- or at least in a different place. By the way, this isn't closed in any way. I didn't go through any door to get this photo. Looking along the back wall from deli. 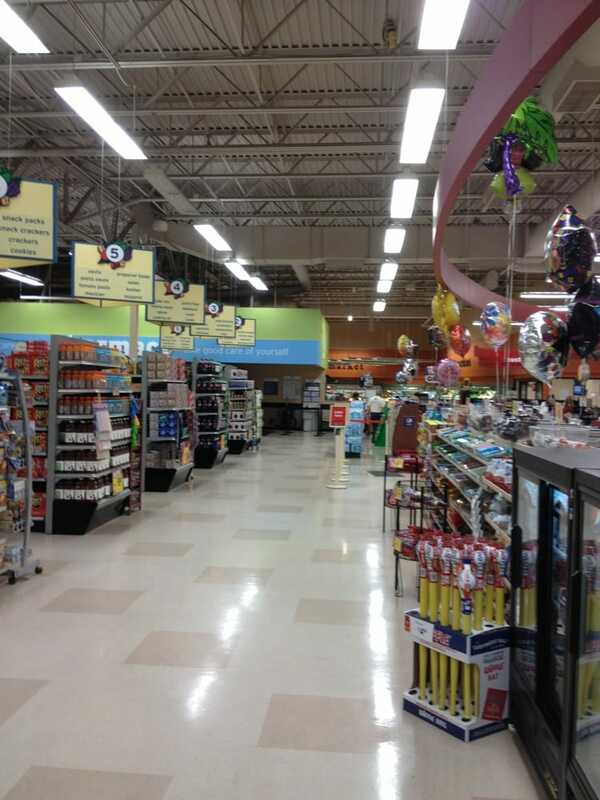 The grocery aisles are pretty standard, although like in the rest of the store, there is a lot of junk around. Bravo in Florida sells the Bravo storebrand along with Shurfine; in NYC Bravo sells the Krasdale brand only. For any Florida retail people -- whose aisle markers are these? I don't know what this property was before U-Save, although it was probably a big chain store. The design actually looks more like Hannaford than any Florida chain. They are quite obviously not Bravo's since they're older than 2011. It pairs perfectly with the empty shelves underneath it. I don't think I'm in the mood for any unch mets today. The "fresh airy" sign appears to be of the same decor package as the City Supermarkets chain in New Jersey, whose corresponding sign you can see here. The last aisle is also frozen foods. If I have to give this store credit for one thing, it's that it was not dirty. I wouldn't go so far as to say it was clean, like the Bravo in Orange is, though. The front corner, which probably used to have some other department, is now stocked with beer and bottled water. Customer service is just on the other side of the advertisement to the left. A look at the cluttered customer service counter. Aside from the clutter, random floor patterns, and burnt-out lightbulbs, the front-end doesn't look bad. There are plenty of registers and the truth is, there is enough space around between the aisles and the registers. The front-end from the entrance side. The area is also plenty bright, from the large windows. The rest of the store feels dingy. Here's the thing: I feel bad for the employees of this store. They can't fix what's wrong with this store when ownership so obviously could not care less what shape the facility is in. I have no sympathy for the owners. And where's Krasdale in this? They obviously don't have the supervision over their Florida stores the way they do over their New York stores. For a company that's worked so hard to improve its image and operations in one area, it's surprising that they'd completely ignore another. If the store really isn't making the money it needs to keep the entire sales floor stocked and to maintain it, close the store. If they wanted to keep a store here, cut down the sales floor, do a big renovation, and make a big deal of the grand reopening. But it obviously isn't working in the space there is. P.S. the Tampa stores all get better from here, including the second Bravo! Scroll down to read my rant about, ahem, response to, an article I read last night! To answer your question, the aisle markers are from a Sweetbay Supermarket. Sweetbay was owned by Delhaize, and used a logo very similar to Hannaford's (see here: https://upload.wikimedia.org/wikipedia/en/thumb/e/e3/Sweetbay_Supermarkets_Logo.svg/1200px-Sweetbay_Supermarkets_Logo.svg.png). Sweetbay was supposed to be a Floridian version of Hannaford essentially, but it didn't work. They sold off all their remaining stores to Winn-Dixie in 2014. The "Fresh Dairy" sign (the one in worse shape) is also a Sweetbay decor sign. This building was never a Sweetbay, so Bravo must have bought the aisle markers and that dairy sign from a Sweetbay that closed elsewhere. Bravo has a bit of a reputation in Florida for running rather dirty, dingy, and gross stores, so the lack of upkeep here really doesn't surprise me. Some of their stores out by Orlando have made our local new station's dirtiest supermarkets and restaurants in Central Florida list. The one Bravo by me in Palm Bay is really tiny, has a horrible parking situation, and smells like rotting produce. I wasn't impressed with that store the one time I was in it (although I feel like I should give them a second chance, as it's been a while since I was there last). However, I don't want to come off as too negative, as Bravo does have some better run stores in Florida. I went to Bravo's store in Port St. Lucie quite often (usually for produce) when I lived down that way. That store was much cleaner and well kept than the Palm Bay one, and had a really good hot food counter. The quality and condition of these Bravo stores must vary depending on how much the store's owner cares. The Port St. Lucie Bravo carried Supervalu's Flavorite brand for a while in the late 2000's/early 2010's, but last I knew they were using Bravo brand and ShurFine like what you described here. I think that's generally the case with any coop grocery store, although Bravo Florida seems to have an extreme range. Since the Bravo and CTown stores up here in the NYC metro market are almost always clean, well-stocked, and well-maintained, I wonder if it has to do with the fact that Krasdale's corporate offices (White Plains, NY) are so far from their operations in FL, so there's virtually no corporate oversight. The stores in FL are almost all larger than any CTown or Bravo in the NY/NJ area, and the NY/NJ stores use Krasdale brand products at both CTown and Bravo stores (in other words, neither ShurFine nor Bravo brands are available at our Bravos up here). It's a shame because I had high expectations given my experiences around here. The lettering on the building definitely looks like it's going to fall down! This has to be one of the saddest looking stores I've ever seen... this, and the short-lived Thriftway in Westmont, NJ. Also, those aisle markers are definitely from Hannaford, although you can buy them online from a Retail Resource company (whose name escapes me at the moment). Looks like, based on AFB's comment, they're actually from Hannaford's sister chain Sweetbay. But yes, this is one of the saddest stores out there! I'd recommend grabbing your hard hat on the way out to the grocery store if you're shopping here!